Tonight’s guest blog post, on the topic of marketing, is brought to you by Christian and cozy mystery author and interviewee Kathryn Jones. Cozy mysteries are a mysterious breed. They include a murder, of course, but a sort of prettied up version of the slash murder and guts variety. The murder, with all of its gory details, is not what’s important here but the drawing out of a superb investigation, by an amateur cop no less. The interesting thing about a cozy, other than the unique writing of it, is the marketing that follows, for not all book reviewers read mysteries, and cozy’s are not for all readers. But for those who review them and those who read them, marketing your cozy mystery in just the right way will create the interest in your book that you need and want. According to a recent Verso survey, it was estimated that 49.2% of readers discovered books through personal recommendations, and this beat out bookstore staff recommendations, advertising, search engine results, books reviews, library visits—even blogs. What this tells me is that you have to talk about your book enough that others read it and recommend it to their friends and relatives. One of my favorite free ways to market my books is to open my mouth. That means when I’m at a restaurant, when I’m standing in line at the post office (sending yet another book off to a reviewer) when I’m at the supermarket, I speak. No, I’m not obnoxious, I just begin a conversation. A good start off point: Have you ever read a cozy mystery? If the answer is yes, you’re off to a good start. You can talk about your book. If the answer is no, you’re still off to a good start. You can share what a cozy is, and if the person still retains interest you can tell him/her about your book. Get creative at your book signings. There’s nothing worse than going to a book signing with a bored looking author sitting behind an equally boring table. Take a look at your book. 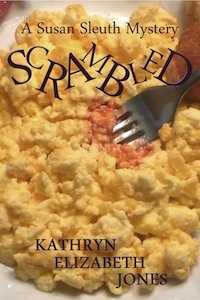 My cozy mystery, Scrambled, has scrambled eggs on the cover. So I took an old plate and wrote with permanent marker around the edge of the plate the first line of my book. (If I bake the plate in my oven for 30 minutes at 150 degrees, the writing will never fade and the plate can be eaten off of). I am also giving away free scrambled egg recipes. Yellow paper, of course. Blogs written with a cozy mystery slant. October is coming up, and with that, all that makes Halloween great. If your book is coming out near October, why not create some blogs of a more spooky nature? Are you also a short story writer? At this site alone, there are numerous ways to get the word out about your book: submit your short story to Morgen Bailey, have it critiqued, and she’ll include links to your website and books. Bailey also offers options to submit flash fiction, book listing, poetry, a spotlight, a guest blog or all of the above options if you choose. Get some interviews under your belt. These interviews could be with a mystery blog site or with a radio blog owner. Mystery blog sites are many, and radio blogs are increasing in number. Check out The Authors Show at: http://theauthorshow.com. Try some free video. I have recently discovered a fun site called animoto.com. At the site you choose music, pictures, video and text that fit into a 30 second video. The video is easy to produce and you can share it later with your social media friends. This is a great, fun way to promote your cozy for free. Keep in mind that the above options for marketing your next cozy are free, but in your searching, paid options will become available. Decide beforehand if you’re going to pay a reviewer or a radio blog personality, or even a video site to help you market your book. In the end, your cozy will stand out from the crowd the more creative effort you put into promoting your work, while still remaining within your budget. That was great (especially number five, although I could be biased). Recent interviewee Patricia Rockwell publishes cozy mysteries. 🙂 Thank you, Kathryn! Kathryn has been a published writer since 1987. She has published various newspaper stories, magazine articles, essays and short stories for teens and adults. She is the author of A River of Stones, a young adult fiction novel dealing with divorce published in 2002, and Conquering your Goliaths—A Parable of the Five Stones, a Christian novel published in January of 2012. One of her newest creations, a Conquering your Goliaths—Guidebook, was published in February 2012, followed by Scrambled in September 2012, is her first cozy mystery. Kathryn graduated from the University of Utah with a B.S. in Mass Communication and a minor in Creative Writing. Her studies included work in creative writing, public relations and journalism. Recently, she has opened the doors to Idea Creations Press, a publishing services company that caters to writers and their writing, publishing and marketing needs. The blog interviews return as normal tomorrow morning with YA novelist Saskia E. Akyil – the four hundred and ninetieth of my blog interviews with novelists, poets, short story authors, bloggers, autobiographers and more. A list of interviewees (blogged and scheduled) can be found here. If you like what you read, please do go and investigate further. And I enjoy hearing from readers of my blog; do either leave a comment on the relevant interview (the interviewees love to hear from you too!) and / or email me. Hi Kathryn! We meet again. You gave some really great tips for marketing a cozy and most of them can be applied to any genre. I especially liked tip #1. I do the same thing: I tell everyone wherever I go about “Mixed Messages.” By the way, if you’re in the mood for a mystery/suspense novel that takes place the week of Halloween . . . .
hmmm sounds interesting. Where can I take a peek? Great ideas here–particularly the suggestion to jazz up a book signing! Since I write dog mysteries I have doggie treats and a variety of Quick Tips (dog training, boarding, etc.) on small cards readers can use as bookmarks. Thank you, Susan. I’ve passed on your comment. Thank you, Susan. I’ve passed on your comment to Kathryn.